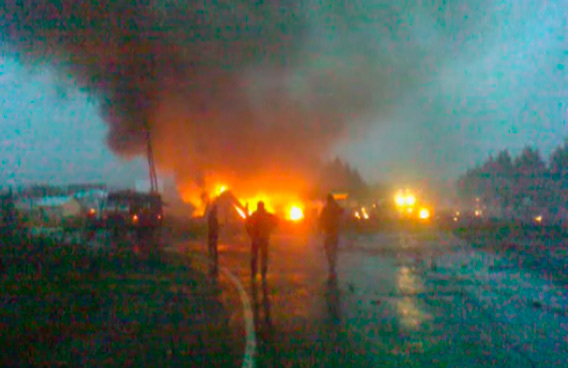 A Russian passenger jet crashed in heavy fog and burst into flames on a highway in northwestern Russia, just short of a runway where fog lights had failed, killing 44 people, officials said. Eight people survived. The Tu-134 plane, belonging to the RusAir airline, had taken off from Moscow and was due to land in the city of Petrozavodsk when it slammed into the highway just before midnight Monday, Emergencies Ministry spokeswoman Oksana Semyonova told The Associated Press. The ministry said in a statement on its website that 44 people were killed. Eight survivors, including a mother and her 9- and 14-year-old sons, were hospitalized in critical condition in Petrozavodsk. No casualties were reported on the ground. Semyonova said the plane broke apart and burst into flames. It was unclear if the plane had attempted to land on the road, or just happened to come down there, she said. Petrozavodsk is in Karelia province, near the Finnish border, about 400 miles (640 kilometers) northwest of Moscow. Russia's top investigative agency said bad weather, human error or a technical malfunction might have contributed to the crash. Adding to the difficulty of landing the plane in deep fog, the runway's high-intensity illumination intended to help the crew at times of low visibility failed just as the plane was on its final approach, Alexei Morozov, deputy head of the Interstate Aviation Committee, said, according to the ITAR-Tass news agency. Nikolai Fedotov, an official with the regional administration, was quoted by the ITAR-Tass as saying that the descending plane itself could have accidentally hit a power line, cutting off the runway lights, but other officials rejected the claim. RusAir said the plane was in good working order. The Tu-134, along with its larger sibling the Tu-154, has been the workhorse of Soviet and Russian civil aviation since the 1960s. The model that crashed was built in 1980, had a capacity of 68 people and a range of about 2,000 kilometers (1,240 miles). Russian television stations broadcast footage of charred plane fragments strewn around the highway. Landing gear jutting out from the ground was the only recognizable plane part. The plane was carrying 52 people, including nine crew members, Semyonova said. Russian news agencies said Russian Premier League soccer referee Vladimir Pettay and a Swedish citizen were among the victims. The Karelia branch of the Emergencies Ministry said radio contact with the pilot was lost at 11:40 p.m. local time. The plane's flight data recorders have been recovered. Prime Minister Vladimir Putin was due Tuesday at the Paris Air Show to support dozens of Russian firms seeking sales contracts. In recent years, Russia and the other former Soviet republics have had some of the world's worst air traffic safety records, according to official statistics. Experts blame the age of aircraft, weak government controls, poor pilot training and a cost-cutting mentality for the poor safety record, leading to emergency landings being reported with alarming regularity. Polish President Lech Kaczynski was among 96 people killed when his Tu-154 crashed in heavy fog while trying to land near the western Russian city of Smolensk in April 2010. In 2006, three crashes — two in Russia and one in Ukraine — killed more than 400 people. The International Air Transport Association noted Monday that Russia has recently made progress on air safety, with none of Russia's 13 largest air carriers suffering an accident with loss of life over the past three years.